I get to help lots of families and schools discover great museums in their cities. Parents often ask about places with specific children’s programs or areas. 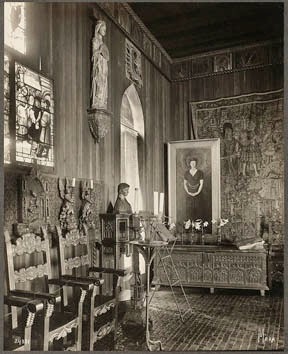 They are hesitant to visit an institution on their own without the support of a museum educator or children’s program. In part, they worry that without a child specific focus, children will be bored, restless or disruptive. 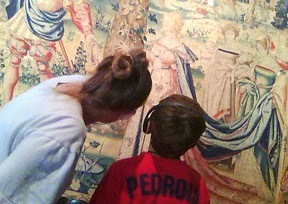 An art museum is a wonderful place for children. Bringing children to museums at a young age increases tolerance, empathy and critical thinking. A visit to a museum also gives kids countless opportunities to reinforce the skills they are learning at home. Young children can practice identifying shapes, colors and feelings, while practicing expressing their opinions. Older children are able to discuss ideas, feelings and opinions, while getting practice expressing themselves and defending their thinking. On the ‘visit us’ section of your website, create a ‘for families’ section. List details about your museum that would be helpful for families to know including the location of family friendly bathrooms, eating facilities (for families looking to purchase or bring lunch), nursing spaces and near by parks or open spaces. If you’ve created any family resources (like guides, scavenger hunts or interactive exhibits) have highlight them on this page. To see a great example, check out the Carnegie Museum of Art’s family visitors page. Everything a parent needs to know, and all the resources the museum provides are listed right on the family visitors page. Create a guide especially for families visiting your museum, and encourage staff to give it to families when they visit. A guide gives you a wonderful opportunity to direct families towards galleries and pieces that are popular with children of different ages, and helps parents take full advantage of your space. It can also help families who feel like they ‘don’t know how to talk about art’ by providing questions and prompts to get the conversation going. The Museum of Fine Arts in Boston’s Guide to Family Fun is a great example. It includes games and questions to engage young ones in the art, highlights engaging exhibits, and gives a rundown of family friendly resources available. A family friendly map is another great way to engage kids in your museum. A map of this type lets children take over navigating the museum, engages them in planning their trip and expressing what they are interested in discovering, all while helping students develop valuable navigation skills. The MET’s Family Map is a great example. In this map, places that are particularly interesting to children are highlighted. The map is simplified showing under a dozen galleries, and the text is larger and more simple. Parents may be hesitant to visit an art museum with children because they are not ‘experts’. There are a ton different activities that you can supply to help parents enjoy the museum with their children. There are a number of activities that are inexpensive to make and are a big hit with families. Provide activity options to families as they enter the museum. One easy activity to implement is a scavenger hunt. Challenge children to find items around a particular theme or to find a specific item in each gallery. Similarly, you could offer laminated activity cards. Activity cards can contain a simple game or set of questions for a family to try with a specific piece of art. On an activity card, you can provide a list of guiding questions for thinking about art. Visual Thinking Strategies (VTS) provide a great jumping off point for family art conversations, and could be the perfect activity to supply. Many institutions have a lot of success with activity bags or backpacks. Fill a bag with a set of activities for a given gallery or theme. Include instructions and the supplies needed to complete each activity. The Denver Art Museum has a wonderful example of an activity bag for inspiration. After a trip to a museum families might feel like they are ‘done’ with the museum for a while. A family club or program can encourage families to return to the museum many times and can help children feel like it is really their place, and help attendance grow. The Philbrook Museum MyMuseum program is a great example. In this program Philbrook visitors ages 4-18 register for this free program and receive an art supply case, sketchpad, and pencil. Each month MyMuseum participants return to Philbrook and receive an art card, which features an explanation of an art object from the Philbrook’s collection as well as a new art supply for their kit. There is so much for families in art museums. Children are naturally curious, and art provides great opportunities for kids to question what they see. By providing a few supports, families can see their local art museum as an exciting part of their local community. Header Image: Miller Family Free Day at Portland Art Museum (Portland, Oregon). Photo by Cody Maxwell. 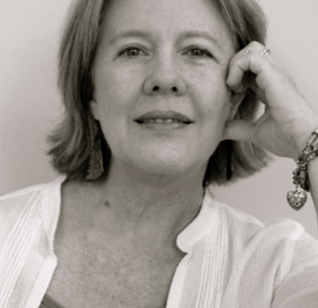 MEG DAVIS: Founder of Explorable Places (www.explorableplaces.com), an online platform that helps museums connect to parents and teachers around curriculum aligned field trips and learning opportunities. Before starting Explorable Places, Meg worked as an elementary educator in both formal and informal settings. Meg has her BA in American Cultural Studies and Education from Bates College and an MS in Childhood Education from Hunter College. All three families scheduled for last week had to cancel or reschedule so it gave me some time to think and have some great conversations with museum educators around the country. What emerged as a theme for me this week was thinking about challenges to facilitating exciting, authentic co-participation in family experiences. I’ve invited Elizabeth Margulies, Director, Family Programs and Initiatives, at MoMA to chime in as she has some valuable reflections to share. 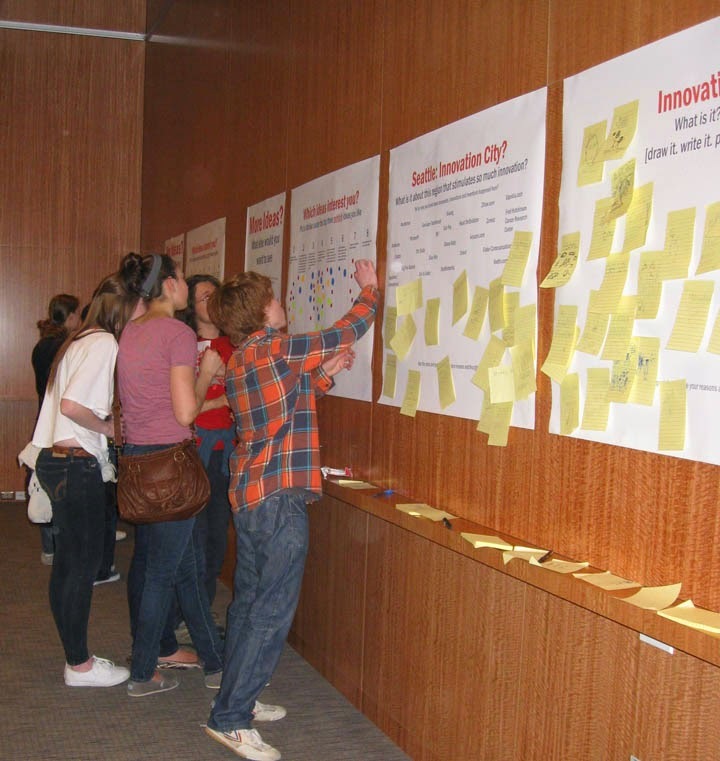 Since 2004, the USS Constitution Museum has been actively involved in experimenting with and evaluating techniques that foster family engagement. Currently their IMLS-funded project “Engage Families” seeks to identify characteristics of family programming that result in active intergenerational engagement, enjoyment, and learning in museums and libraries. To assist that effort, I implemented an online survey of museum and library professionals around the country in November 2013. Two key findings emerged that will be the focus of this post: 1) professionals value and want to create fun, authentic, opportunities for visitors of mixed ages and interests to co-participate and learn together; 2) accomplishing this comes with many challenges. We want to address two frequently cited challenges here. 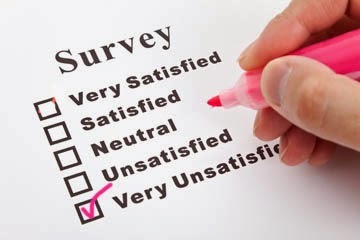 The most frequently cited barrier to achieving their vision for engaging family programs in the USSCM study was lack of resources – specifically time, money, space, and/or staff. Interestingly, whenever I ask museum professionals what prevents them from doing anything this is often the first response. For me, these resources will always be in limited supply, therefore, they become expressions of what we value. For example, we might say that regular exercise is important, but unless we really value it, we will not juggle our personal budgets and complex schedules around to get to the gym or that yoga class. MoMA is proactively addressing how family programs are perceived and value within the organization by engaging in a cross-departmental dialogue. Retail, Publications, and Education began meeting over a year ago to see how we might build on the success of some publications written by Education and developed by Retail. In our conversations we realized that we could use some help defining what we all wanted and we hired an outside consultant, Stephen Gass of The Gass Company to work with us. 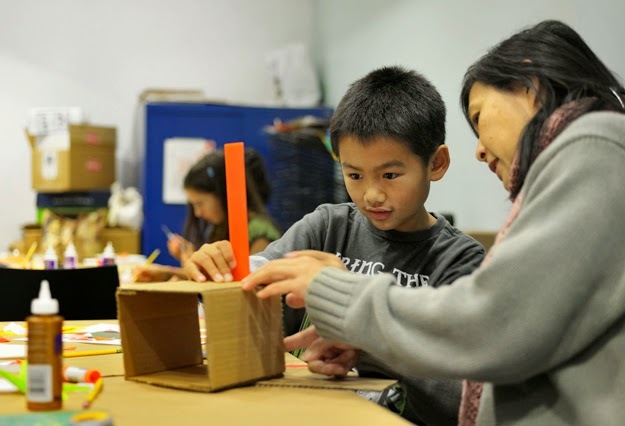 The goal is to articulate the personality and voice of the programs, experiences, and products MoMA creates for kids and families along with the values that drive our decisions. It’s been gratifying to find that everyone thinks this is a worthwhile effort. We wouldn’t have known how important everyone felt the child/family audience was if we didn’t bring them all together to discuss it. If lack of resources tends to be your main reason as to why you don’t have the kind of family experiences you say you want, then this is where your work has to start. What are ways that you have been able to shift the culture of your organization towards a more family-friendly position? 2. But Parents Won’t or Don’t Want to Participate! 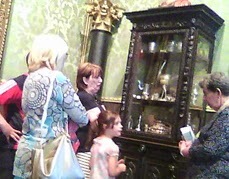 Museum and library practitioners express concern and even frustration at not being able to get the adults to engage or to engage “properly.” This always raises the question “What is proper?” When I have felt like being the “bad” grandparent and check my phone, it’s mostly because I’m bored. Either I’ve been separated from my wonderful granddaughters or what we are being asked to do is uninspired and/or disconnected from what’s important in the artwork. It always comes back to intention. If we want co-participation across generations then everything we do has to support that intention. I’ve heard from that when they clearly and consistently communicate the expectation that adult caregivers participate, they have better engagement within the groups. 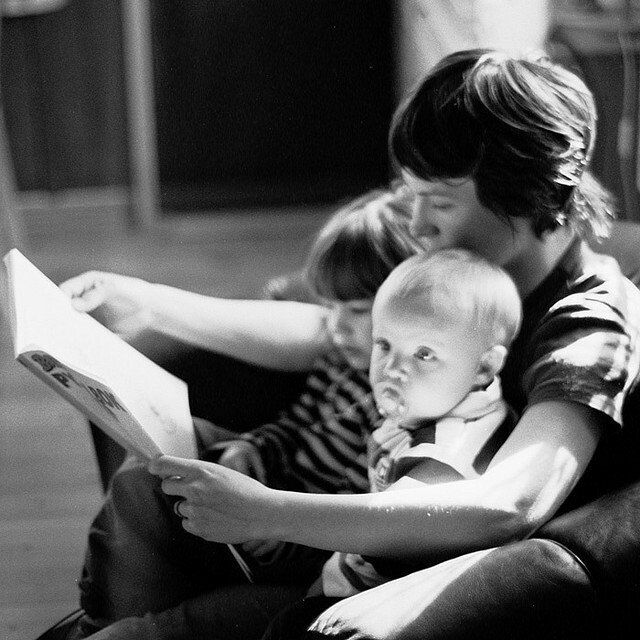 Certainly we want families to feel comfortable doing what they feel is best. There always needs to be room for groups to engage as much or as little as they want. 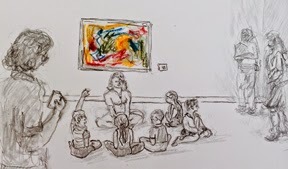 As the educators at MoMA and the American Museum of Natural History advise, if we communicate clear intentions early and often then we will see more co-participation and enjoyment. More importantly, if what we are asking groups to do is compelling then there will be more engagement. Studies suggest that some parents want to hand over the experience to the program facilitator. We always have to graciously accept that some people don’t want the experience we’ve provided. In that case, if we are true to our intentions they will self-select other programs that better suit their needs. It’s also why a variety of youth and family programs is advisable. But enough about the parents/caregivers. I want to focus more on the responsibility of the museum educators who deliver experiences designed to encourage co-participation and engagement. 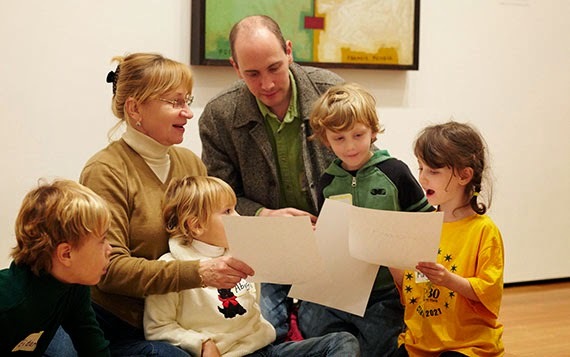 Some museums are able to hire experienced museum educators for their family programs, giving greater consistency and depth to the experiences. For many museums, family programs seem to be shuffled off to the youngest, least experienced facilitators who are given almost no mentoring on how to engage intergenerational audiences effectively. Be positive and do away with the word ‘No’. Tell visitors what they can do at the door, don’t pin up a list of things they can’t. Share storieswith each other. Listen. Families can be experts too. Don’t say ssshhhush! If kids are being noisy, ask yourself ‘Why?’ Is it because they’re excited? Great! Then capture that excitement. Is it because they’re bored? Then give them something meaningful to do. Say ‘Please touch!’as often as you can. Everyone finds real objects awesome. Direct kids to things that can be handled, teach respect and explain why others can’t. Give a hand to grown-upsas well as children. Sometimes it isn’t the kids who are shy – parents need your support too. Produce guides, trails and activities so everyone can join in. Be aware of different families’ needs.Use your imagination with signs, symbols, and words understood by all. Design everything you offer to be equally accessible to disabled and non-disabled visitors alike. What strategies do you use to facilitate greater co-participation within and across family groups? ELIZABETH MARGULIES, Director, Family Programs and Initiatives, Department of Education, joined The Museum of Modern Art in 1999. 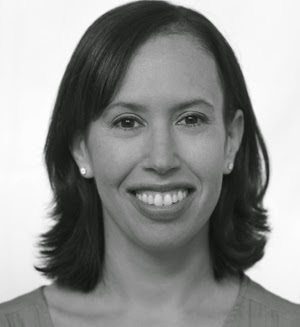 Elizabeth designs, develops and oversees MoMA’s wide array of Family Programs and resources including gallery talks, workshops, artist talks, film programs, digital projects, activity cards, games, audio guides and the Museum’s interactive space, MoMA Art Lab. She collaborates with MoMA Retail and Publications, on children’s books and products, and in 2010 with Cari Frisch, co-authored, Make Art, Make Mistakes: A Creativity Sketchbook. In 2012, she collaborated with colleagues in Education, the Museum’s Digital Media and Graphic Design Departments, and Rendor Monkey, to launch MoMA Art Lab, an app for the iPad. The app won a 2013 Webby Award in the Education & Reference (Handheld Devices) category, and a Parent’s Choice Silver Honor for app design. Before coming to MoMA, Elizabeth worked in theatrical and television production. She holds a B.S. in Theater from Skidmore and a Master’s of Education from Bank Street College of Education. Elizabeth has taught in both public and private schools in New York. I know this sounds a bit too new-agey but it’s what keeps coming up for me after my first full week in my residency at the Gardner Museum. Three families came to the museum this past week and the best way I can describe the experience is that I just fell in love with all of them. They arrived so excited and in good spirits, even if some of the children were a bit wary at first. Their openness to new experiences reminded me to be more open in turn to their unique ways of visiting and looking at art. A few reflections are shared below (while the experience are real, the names of the family visitors have been changed). I am continually fascinated by what draws children’s attention and this week’s visits were no exception. Typically it is not what educators tend to include on tours. 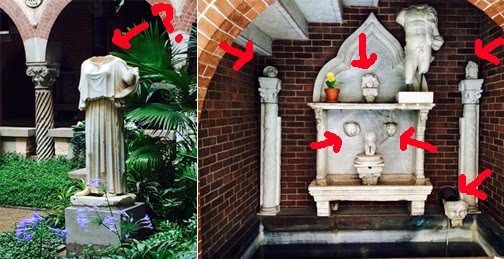 For example, Suzie was first taken with the missing head on a statue in the courtyard. Throughout the visit she commented on how many statues were missing heads and arms. This caused us all to heighten our attention to what was missing. When we passed along a hallway to go upstairs she paused at a niche housing several stone and marble heads a long with a sculpture missing all limbs and the head. She said, “Oh, so this must be where they keep the heads” and calmly walked on. Because the Gardner is one of the few museums lit primarily by natural light, and there are many cases with small, fascinating objects and notes, sometimes things can be difficult to see. Even though, there were opportunities in all the groups where they were straining to see something they did not ask to use the flashlights. 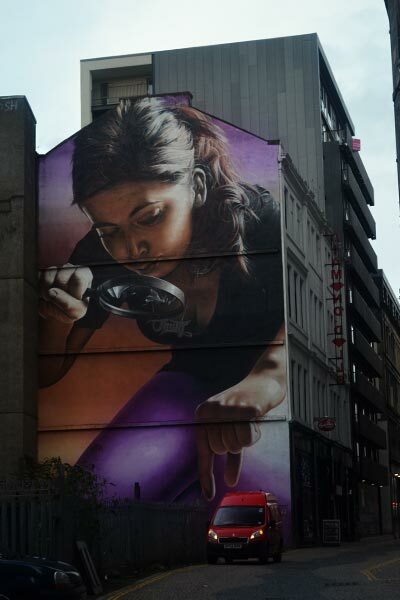 or magnifying glasses. Sometimes I would shine the light where they were looking and everyone in the group would gather round and spend more time looking and talking. Reports from families a few days after the visit suggested that the flashlights were a big hit, even though they never directly asked for them. Children frequently stumped us all with their insightful questions that we couldn’t answer. When that happened, all of us, adults and children, got involved in the conversation, equally contributing bits and pieces of what we knew and speculating on all the possible answers. Yes, I could analyze these interchanges and point to how they are modeling critical thinking, good inquiry, and how children need to see that no one has all the answers, but I’m not. They were just beautiful moments of people coming together and puzzling out something. I want to leave it at that. It’s challenging for educators to intentionally lighten up on content in any museum experience, even though research continually finds that family motivations for museum visits is NOT to learn new knowledge. Families seek an enjoyable time together that serves as a sort of family glue, creating memories that they continue to share. Certainly parents and children like to learn things but it’s not the focus or reason for their visit. At the beginning of the visits this week, I let families know that I did not have any plans for them, I just wanted to wander around with them, that I didn’t know the collection but there was a Gardner Museum educator with us in case there was anything they wanted to know. Having a knowledgeable person with us proved to be a popular feature for families, for when questions came up Julia Brucker and Michelle Grohe were there. I’m grateful for their skilled ability to know just when and how much to engage so that the experience stayed in the family and was not diverted to the educator. That said, the families did not automatically think to ask the educators when a question arose. In most cases, after listening to families wonder out loud about something, I suggested asking the museum educator, which they eagerly did and it enlivened the conversation. I’m not sure why this is the case and together with families enjoying but not asking for the magnifying glass and flashlight, it feels like a pattern might be emerging. I will see if it continues in this week’s visits. At one point a group intercepted a gallery volunteer roaming the gallery for just this purpose. The volunteer noticed that Suzie and Chuck were interested in a silver encased ostrich egg and talked to them about it. This brief interchange warmed my heart as the volunteer was focused totally on the group’s interest and experience. She had no agenda except to facilitate visitors’ interest. Realistically we can’t accompany every family group in this way, but it feels increasingly important that we, as educators, connect with audiences on more than an intellectual level. Finding practical ways to fall in love with the visitors seems key to me. When we connect with visitors on a deeply human level then the way we design experiences will change. When we start to see visitors as thoughtful, insightful friends who are eager to explore what the museum has to offer, we stop seeing them as security risks or potential dollar signs. I invite you to find your own ways to authentically connect with your visitors and share what happened. Note: All the photos were taken with Blynk a tiny time-lapse camera during the family visits. This little gadget is now my new best data-collecting friend. And the “Stumped the Chumps” reference is a nod to Car Talk. Museum Educators know that providing experiences for family audiences are a valuable way to advance the museum’s mission, expand its audience, and strengthen its place within the community. A relatively new way many museums are providing for families is with interactive exhibits. In recent years, these family spaces have evolved from engaging only children to engaging the entire family. This shift has opened up new areas of study in family learning, broadly defined by the Family Learning Forum as “a special form of free-choice learning” that results in “shared meanings among and between family members.” I like this definition because it presents children and adults as being equally active in family learning. While many family programs and family spaces in museums focus on outcomes for children, I wondered what I could learn if I studied the adult half of the family learning equation. In 2011, I took a look at how adults, in the context of their families, used the Building Zone, a family space located in the National Building Museum in Washington, DC. Through observations and surveys, I uncovered a few sweet spots for parental engagement. I already knew that blocks provide endless learning opportunities for children, but now I’m starting to think they are the absolute perfect toy. The majority of parents’ active engagement took place in the Building Zone’s two block areas. One at the front of the room consists of bins of small blocks with various architectural shapes and designs and larger foam blocks. The other block area spans the back wall of the room and has two different types of large plastic interlocking blocks. The block areas were the most popular places for caregivers to actively play with their children. I even occasionally observed adults building structures by themselves. I also think their emphasis on family and multi-generational participation is a welcome change; often discovery and play spaces have been perceived, either because of their design or because it was assumed, as places for kids only, and adults just stood and watched or wondered off to see the rest of the museum. 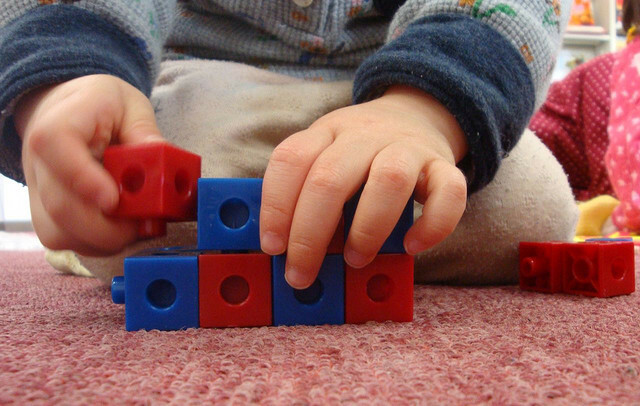 My theory is that blocks can be interacted with on many different developmental levels. It doesn’t matter whether the fun stems from exploring the cause-and-effect relationship of knocking down a tower or exercising complex problem solving and abstract reasoning skills – blocks can interest people all ages. The adults I observed were much more interested in helping their children build than pretending to drive a toy truck. Another common area for parental engagement was the Book Nook, a corner of the room with pillows on the floor, bookshelves, and a few puppets. As with blocks, adults seemed comfortable interacting with their children around books. The children in the Building Zone were all pre-readers, so this is another area in which caregivers could use their knowledge and skills to help their children. The Book Nook was also the only area, aside from the block areas, that I observed adults engaged with the materials by themselves. A couple of times, I saw adults reading the children’s books silently to themselves. Again, I believe the books appealed to the adults’ developmental level. Stories, like blocks, can be approached and interpreted in different ways. High-quality picture books have layers of meaning embedded in their text and illustrations that require abstract thought and background knowledge to understand. The two adult-sized benches in the middle of the Building Zone were one of the most popular places for adults to be in the family space. While caregivers played the most in the block areas and the Book Nook, a different kind of engagement was taking place on the benches – caregivers were observing the children. Part of the Family Learning Forum’s definition of family learning is learning about each other. While Susie Wilkening of the Reach Advisors is right to be concerned when parents don’t engage with the museum content at all, I think it’s important not to overlook observing one’s children as a form of parent engagement. This is especially true when you consider that the adults I surveyed hoped that they would be able to observe their children playing in the Building Zone and said that being able to observe their children having fun is one of the things that makes a family experience positive. I’m curious to know what readers think about active versus passive forms of parent engagement. To what extent should museum family spaces be designed to encourage parent’s active participation, and to what extent should they be designed for passive observation? Museum family spaces are sites for complex social interactions and learning experiences. Focusing on the family as a whole in the areas of family learning and parent engagement allows museums to create meaningful experiences for all their visitors. Have you noticed any sweet spots for engaging parents with children in your museum?